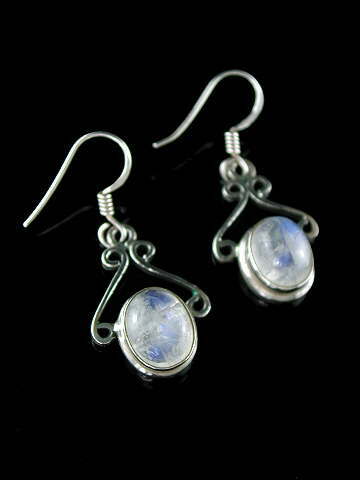 Lovely oval cabochon Rainbow Moonstone earrings with a super blue-flash, in a 925 sterling silver, scrollwork design setting. Rainbow Moonstone is the mineral Oligoclase from the Feldspar group. Moonstone and Sunstone are its commercial, or gemstone names (Sunstone being Oligoclase with hematite inclusions, which give it its orangey/red colour). Rainbow Moonstone, so-called because in daylight it shimmers with an ethereal glow reminiscent of moonlight, has a very gentle, feminine energy. It is also known as the Wish Stone. It has been used to strengthen intuition and to heighten the psychic experience. Its rainbow energy, resonating with the whole spectrum, is a great cleanser on all energetic levels. It is one of the best protective crystals, instantly dispersing negative energies on contact. It can have blue, green and rarely, pink flashes. Anyone can benefit from the subtle energies of healing, but it is not meant as a substitute for seeking medical advice from a qualified medical practitioner. Therefore, if you are in any doubt about a medical condition you should consult your doctor in the first instance. The healing properties mentioned throughout this site in relation to crystals and gemstones represent views expressed in the public domain. We have not undertaken any scientific studies to verify their validity. Find Us In . . .